Here is a basic layout that illustrates how lines recede in one point perspective. Horizon line-is always at eye level. Picture yourself at the seashore and looking out at the ocean you notice that the water meets the sky at your eye level. This never changes. You may be in an airplane 1000 feet up and the level that the ocean meets the sky is still at your eye level! Or you may be lying down on the beach and the ocean level drops with you. Think of it as an invisible plane that cuts through everything, that always exists at eye level. Your horizon line always falls at eye level regardless of where you're looking. For instance, if you are looking down, your eye level remains at the height of your eyes, not down where you are looking. Vanishing Point-is the point to which all lines which are parallel to the viewer recede. You may want to think of the last time you were looking down a long stretch of straight highway. The edges of that highway appear to move at an angle upward until they meet the horizon. In one point perspective all verticals and horizontals stay the same and only lines that are moving away from or toward the viewer seem to recede on the horizon at the vanishing point. All planes must be perpendicular or parallel to you in order for 1 point perspective to work correctly. If you are looking at the corner of an object that is not at a 90 degree angle to you this will create distortions! 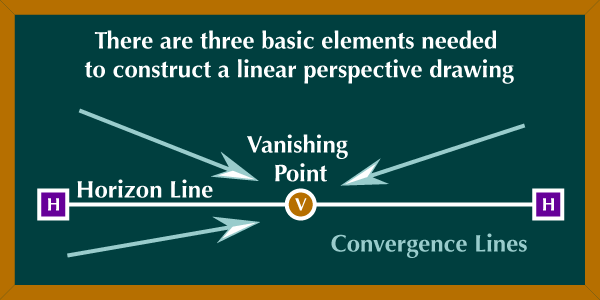 Convergence Lines (also called orthagonals)-are lines that converge at the vanishing point. These are any lines that are moving away from the viewer at an angle parallel to the direction that the viewer is looking. In the case of the highway that we mentioned above these lines would be the edges of the highway as they move away from you forward into the distance. Try drawing a straight highway or railroad tracks using horizon lines, vanishing points, and convergence lines. An example of convergence lines as they recede can be found in Giovanni Battista Piranesi's, Fantasy on a Magnificent Triumphal Arch, from 1765. If you look carefully at the side of the building, you will notice that the bricks and other diagonals on the triumphal arch are a series of convergence lines that change in relation to the horizon line. The line that is closest to the horizon line will be almost flat and lines higher up will have a greater angle downward as they get further away from the horizon line. You can see where Piranesi has left some of his convergences go beyond the building directed toward the vanishing point.